The playing area was situated at the centre of the Peking University Gymnasium. It held eight tables, enclosed by playing area surrounds, with each court measuring 16m x 8m. 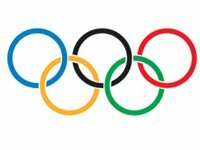 During the first 2 days of the team competitions, the contests were played on 8 tables at the same time. In the remaining days the number of tables used at the same time changed from four to two and one respectively. 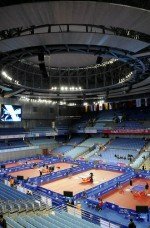 There was a warm-up area with sixteen courts, each of them measuring 14m x 7m, in the basement of the competition venue. 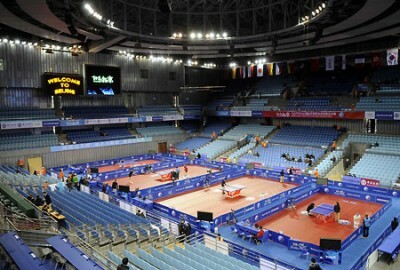 The Peking University Gymnasium was the world's first sports venue designed and built for table tennis competitions. Table tennis players require an environment with few distractions and therefore air conditioning is very important. The venue addressed this requirement with an air conditioning system that released air no faster than 0.2 m/sec. 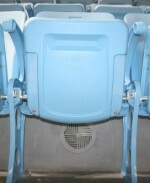 The spectator seats had air replacement vents installed underneath, thus lessening the reliance on air conditioning. The gymnasium's double-layer metal surface was waterproof and heat insulating. It also eliminated noise from rainfall, and the walls also absorbed sounds.